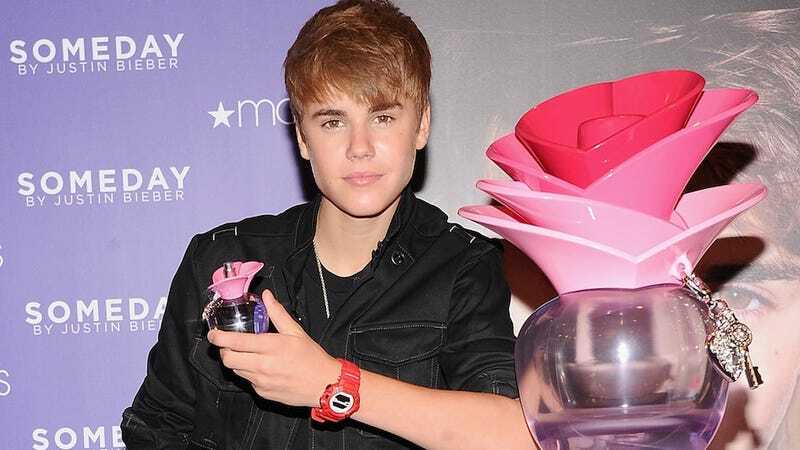 Have so many celebrities cut deals to produce their very own branded fragrances that the perfume market is finally saturated and everyone is sick of smelling like Kim Kardashian/Britney Spears/Justin Bieber? Let's hope so! According to Marketwatch, Elizabeth Arden's stock has taken a dive, after a disappointing quarterly report citing poor perfume sales: "The decline in sales of celebrity fragrances, particularly the Justin Bieber and Taylor Swift fragrances, was steeper than anticipated," according to the company. Sales dropped 28.4 percent year-over-year, "after it introduced fewer new fragrances and sales of popular ones faded faster than expected." And yet, the product announcements just keep coming. Rihanna just debuted a line of men's colognes, according to WWD, and she plans to launch another line for women in 2015. Last week, Lady Gaga announced a new scent; the week before that, Drew Barrymore introduced three. Even perfumes that aren't pegged to a famous name are often associated with a recognizable brand: J. Crew is launching two new scents, while Guess is going after millennials. Obviously, it's easier to introduce a new product with some known name slapped on the side. But even America only has so much stomach for celebrities. Let's pull the plug and get some vintage glamour, some citrusy smells unassociated with anyone who's ever appeared on MTV.